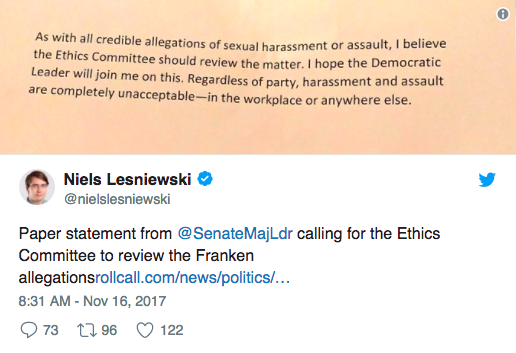 Al Franken is not the first sacrificial lamb — and definitely won’t be the last — as Americans refuse to acknowledge or take action against the fine-tuned Propaganda Machine that is omni-present on our social media platforms. America has its very own Joseph Goebbels, yet we seem to be either too ignorant to history, or too ignorant to technology, to acknowledge and deal with the massive propaganda machine that’s been assembled over the last 2 years here in America. Al Franken is just the latest casualty, and there will be more. It’s disturbing to see Americans still falling for the same dirty tricks we fell for the entire 2016 election season. We have the benefit of hindsight now and a cavalry of expert citizens educating us about propaganda and how to counteract it. Yet time and again, we are let down. Our media fails us. In their desperation for clicks they hop on any bandwagon that appears lucrative. And our people fail each other. They suspend critical thinking skills to line up on “sides” that don’t even truly exist. 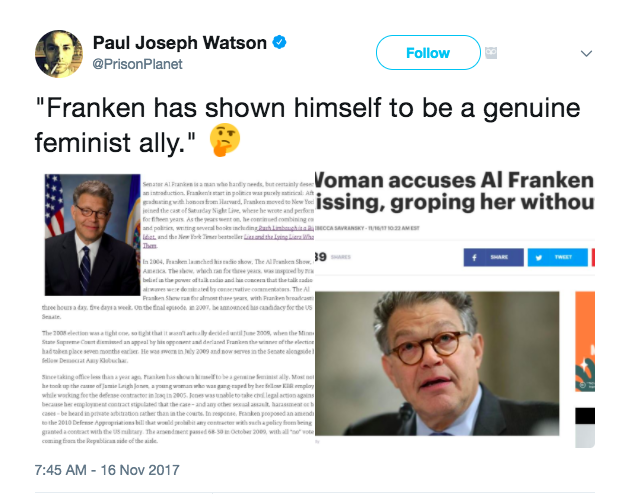 So let’s use this past week’s Al Franken “scandal” as an illustration of the latest pizzagate-style propaganda hit job against our common senses. These manufactured “news stories” always follow the same distribution and amplification process, with few (but detectable) variables. We start on Wednesday, November 15th at 10 PM — a full 9 hours before Leeann Tweeden shares her “#metoo” story with the world. For an alt-right super-villain at the center of the “Russia-gate” conspiracy, American’s seem to be surprisingly unconcerned with the contemporaneous activities of Roger Stone. Suffice to say, he’s currently under federal investigation for his role in coordinating the DNC hacks with Guccifer 2.0, a “Russian hacker” who has since been identified by American Intelligence as an agent of the Russian FSB (aka KGB). But what he’s doing present tense to weaponize information as part of America’s flourishing Alt-Right Propaganda Machine appears to fly largely under the radar. 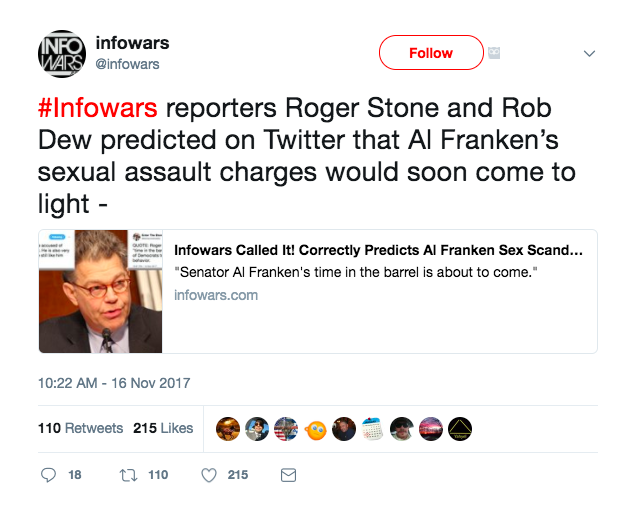 Roger Stone, who was banned from Twitter several weeks ago for his repeated policy violations for hate speech and terroristic threats, teased the “Al Franken” news in typical Roger Stone fashion — via 2 proxy accounts at 10:12 PM and 10:21 PM respectively the night before Leeann Tweeden published her account. 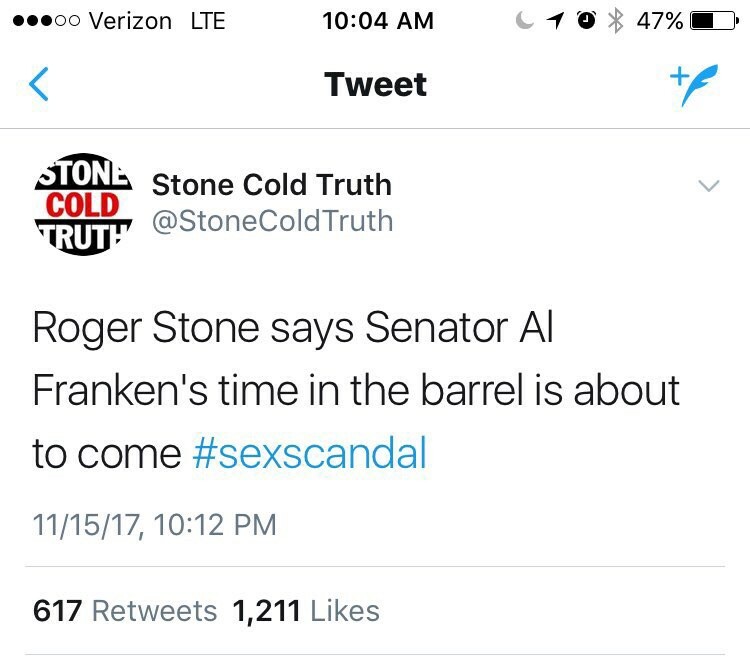 It’s important to remember here that Roger Stone is not a journalist or in the (official) employ of any media organization. He is a lifelong political operative who’s gained a cult following of “pepes” and “deplorables” through his connection with the Trump campaign and their network of alt-right media outlets who thinly-coordinate these propaganda campaigns. When Roger Stone tweets — the troops assemble. If Stone is a Propaganda Minister, then alt-right activists like Michael Cernovich and Jack Posobiec are his devoted gruntmen. They stand ready with a “digital army” in spades, and it doesn’t take much to signal the orders. Over 2 years, these players have fine-tuned their coordination in brazen fashion. That’s part of the way their disinformation has been successful. When it’s done out in the open, it somehow becomes harder to believe. 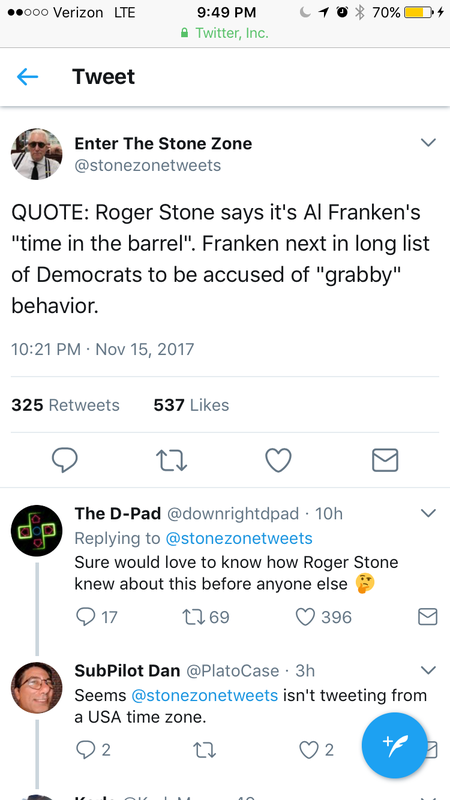 So, by late Wednesday evening, the Twittersphere is abuzz with the impending Al Franken takedown courtesy of Roger Stone. Behind the scenes, it’s logical to assume that preparations are being made to ensure the story’s amplification and success (more on that later). 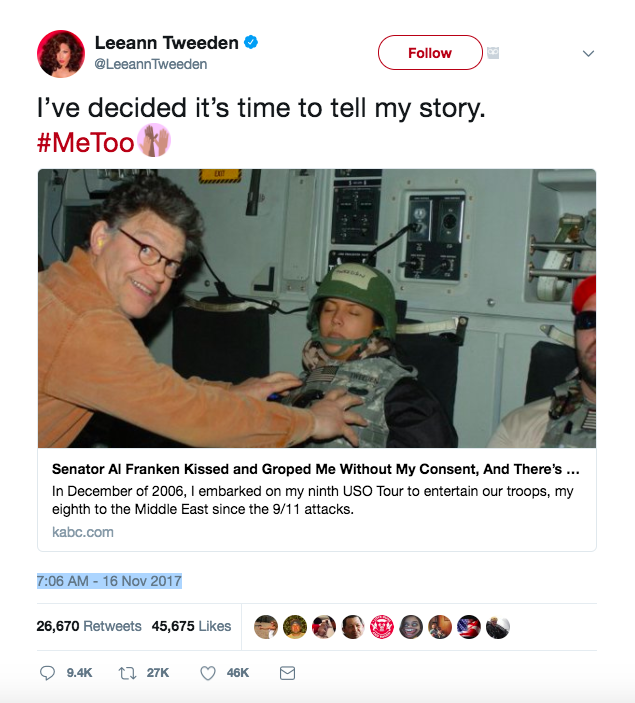 It’s 7:06 AM on Thursday, November 16th when Leeann Tweeden posts her article to Twitter. Unlike the meticulously researched, 30-source vetted and editorially scrutinized Roy Moore article from Washington Post decried as “fake news” the week before, Tweeden’s is a first-hand account published on her employers AM radio website with no corroborating sources or witnesses. The photo and alleged kissing incident would have been observed by countless people on the tightly-monitored trip, yet Leeann appears to have reached out to no one to go on record. Who does she reach out to though? Under normal circumstances, the needle in the haystack nature of this KABC-AM article would all but ensure the story barely sees the light of day. But when you have the muscle of the Alt-Right Propaganda Machine behind you, a pizza parlor without a basement easily becomes an underground child trafficking hub. And clearly, Leeann Tweeden had that muscle on deck. Within 20 minutes of Tweeden’s post, it appears TheHill.com becomes the first to report the story*. A fully-developed article by Rebecca Savransky is posted to The Hill’s Twitter page at 7:23 AM. As events unfold from here, Savransky’s article can be seen as “useful” to the larger plot (i.e. providing cover for the Propaganda Machine), but it seems unlikely she wittingly co-ordinated. At 7:45 AM, Paul Joseph Watson, an “editor-at-large” for InfoWars, shares The Hill article on his Twitter feed. Within one hour of Leeann Tweeden posting her article on Twitter, InfoWars and Breitbart are reporting on it themselves. InfoWars publishes their first, fully-developed article at 8:45 AM from Paul Joseph Watson. Watson’s 756K followers quickly begin to spread the link. But Breitbart appears even more efficient. “Editor-at-large” John Nolte shares Tweeden’s tweet within 20 minutes of her posting it, and he has a fully-developed story published on Breitbart before the end of the 7 AM hour. Alas, while the Alt-Right Propaganda Machine is effective, it isn’t without screw-ups. Take, for example, a simple trace of the link to the Breitbart article. 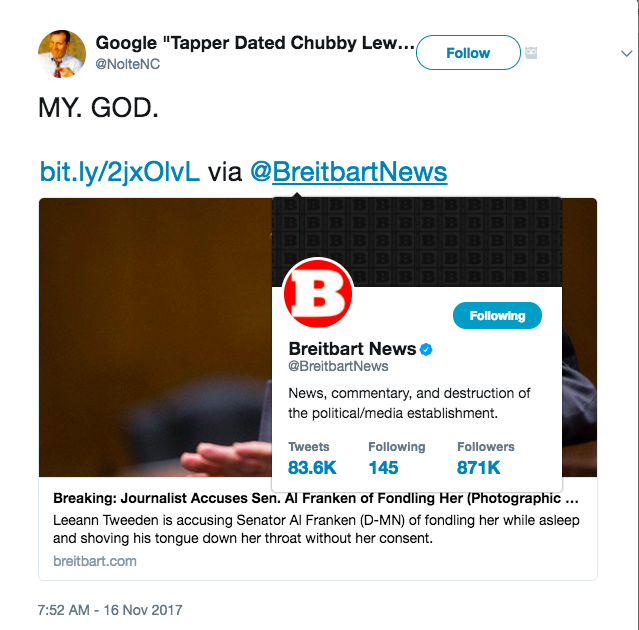 A Twitter search reveals that it first starts getting shared by bots at 7:41 AM, before the author or Breitbart News have even posted it to their Twitter accounts. Oops! Interestingly, InfoWars never posts Watson’s article on their Twitter account, instead issuing a brief article at 10:22 AM targeted at confusing the onslaught of “how did Roger Stone know?” tweets already swirling around. Easy — they “predicted it”. 5. Bots descend to explode the story — full amplification occurs within hours. For reasons that defy comprehensive, Americans have chosen to remain willfully ignorant on the topic of bots. Somehow, the very idea of bot networks has become fodder for “conspiracy theorist” accusations. Yet for those who work in the digital field, bots have been an inherent part of the landscape for several years now. Before these networks were weaponized for political gains, their main purpose was to create “engagement” on advertisements, so that advertisers could game algorithms for better visibility and social media platforms could financially benefit from what would otherwise be a poorly-performing ad. 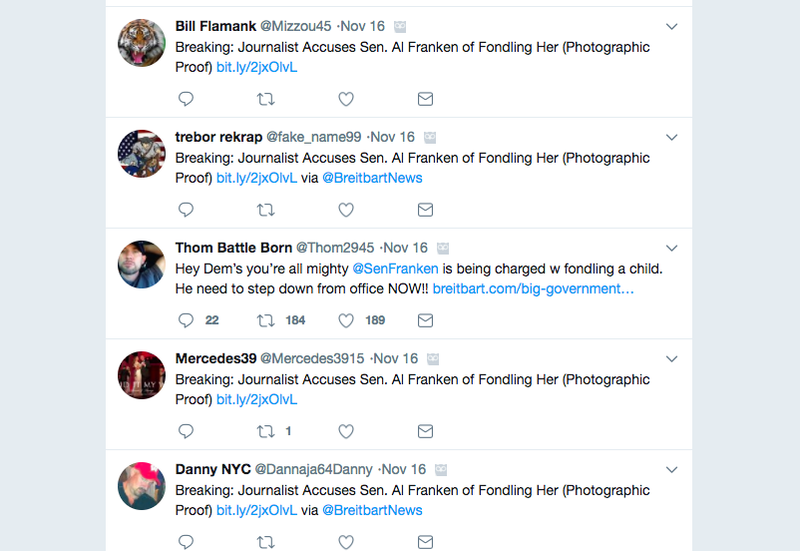 By 8 AM, the Twittersphere is awash in Al Franken “news”, with timelines bursting at the seams from shares of the scandalous image and links to the obscure KABC website. Clint Watts, an expert in Russian propaganda and the weaponization of social media, launched The Alliance for Securing Democracy in August of this year to more accurately track Russian influence operations on Twitter. 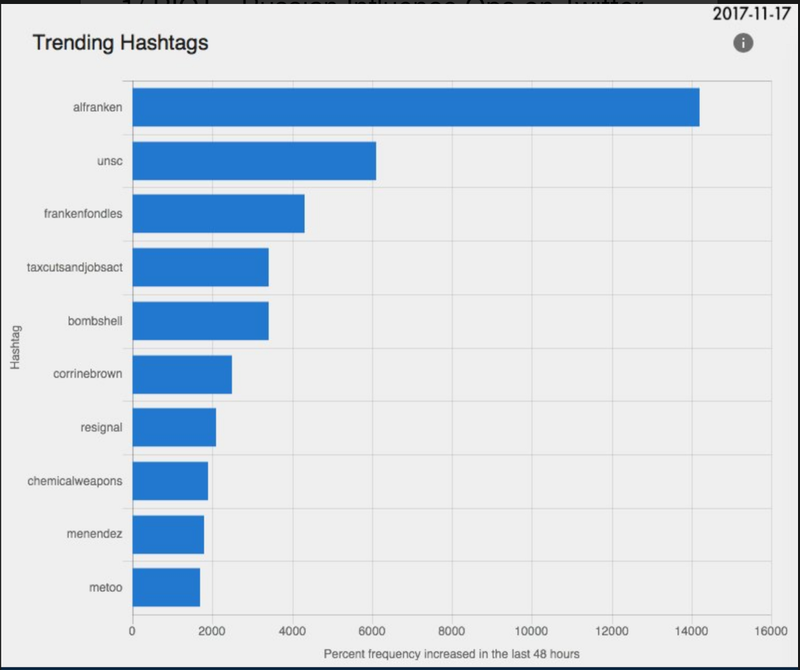 Using 600 known Russia bots as a representative sample of what is likely to be millions of active accounts on Twitter, the ASD dashboard clearly demonstrated that by November 17th, this had become a R.I.O.T. (Russian Intelligence Operation on Twitter). Psychological operations are effective because they are tried and true manipulations of the way in which we process information. 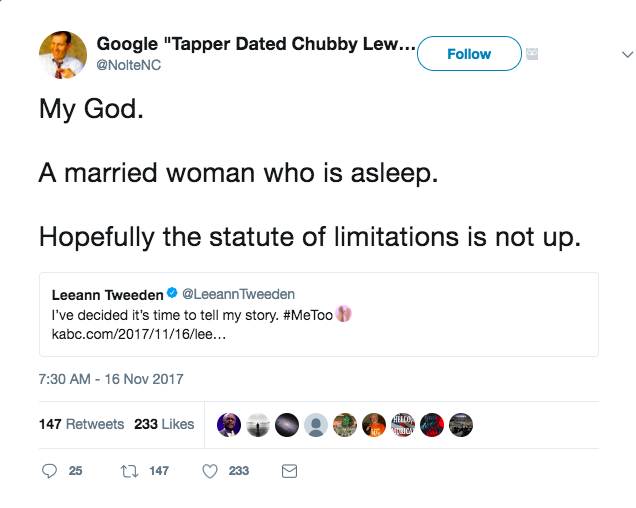 So knowing that an accuser’s story can be easily dismissed when not corroborated (as Leeann’s was not), the story must be given the appearance of “#metoo” support. First there’s this tease at 7:54 AM by fringe syndicated columnist Phil Kerpen. 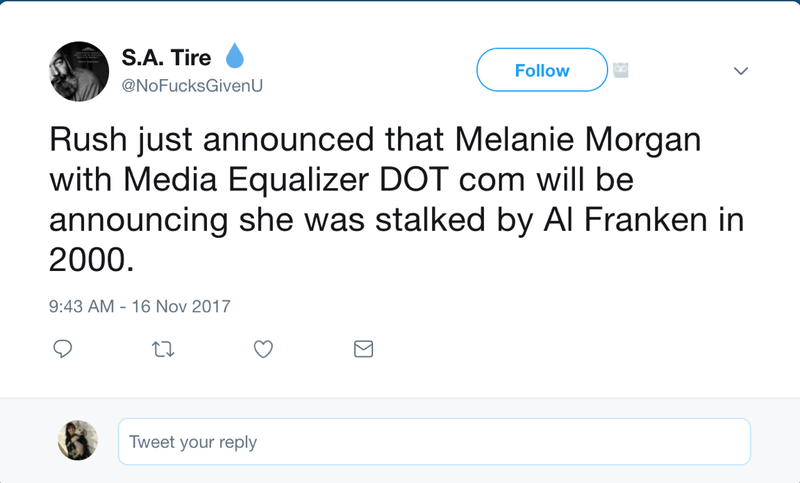 Then, by 9:43 AM Rush Limbaugh announces he has received an email from Melanie Morgan, founder of fringe blog Media Equalizer, claiming harassment by Al Franken as well. 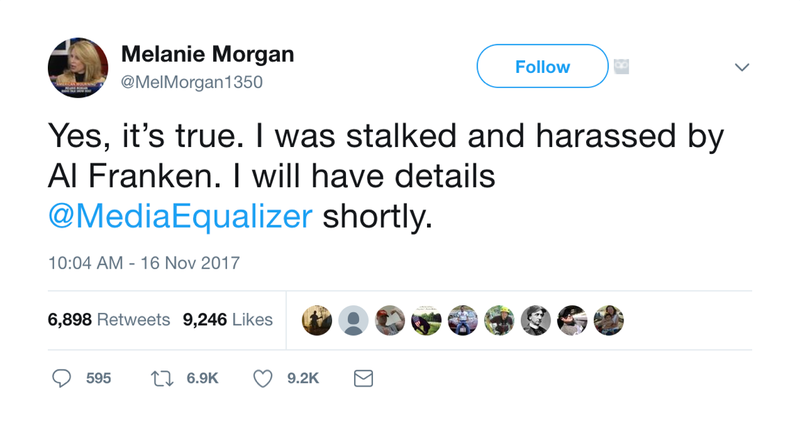 Within 15 minutes, Melanie Morgan tweets that she will be sharing her story. An hour later she has it published on her blog. Suffice to say, calling someone 3 times to debate a policy point is hardly grounds for stalking and harassment (especially not sexual harassment). But that’s not what matters with propaganda. In psyops, all that matters is repeated exposure to the message. To gaslight someone, all that matters is that confusion is created. At this point in the process of dissemination and amplification, the mainstream media and our politicians start doing the job of the Propaganda Machine for it. Like the definition of insanity, they repeat the same mistake over and over and never learn. 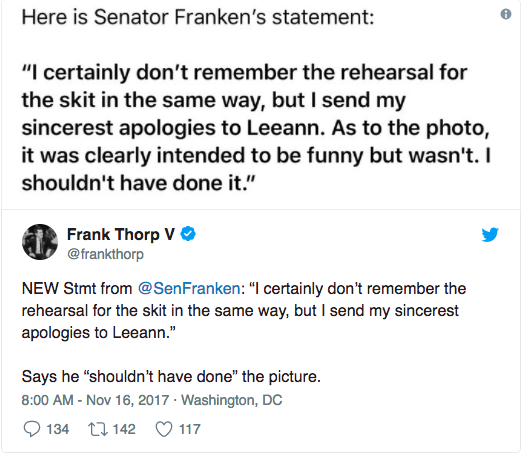 So by 8 AM, as the bot action intensifies, we already have Senator Franken issuing his first apology. 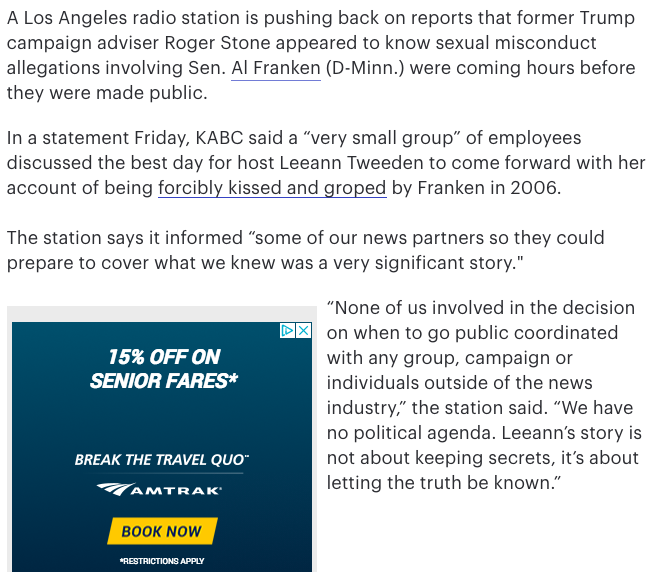 Mind you, this is less than an hour after an AM radio website has published its first-hand, uncorroborated account from Tweeden. It is also hours before the InfoWars and Breitbart articles — then being circulated only by the authors, their followers, and bots — have even posted on their respective Twitter feeds. Without the Propaganda Machine’s impact fully realized, Franken first dismisses the story as merely an unfunny joke. But then, within 30 minutes, Mitch McConnell is already calling for an ethics investigation. An hour and 30 minutes after an uncorroborated account has been published on an AM radio website, McConnell feels he has enough information to call these “credible allegations”. He even has time to issue it as a…..paper statement? 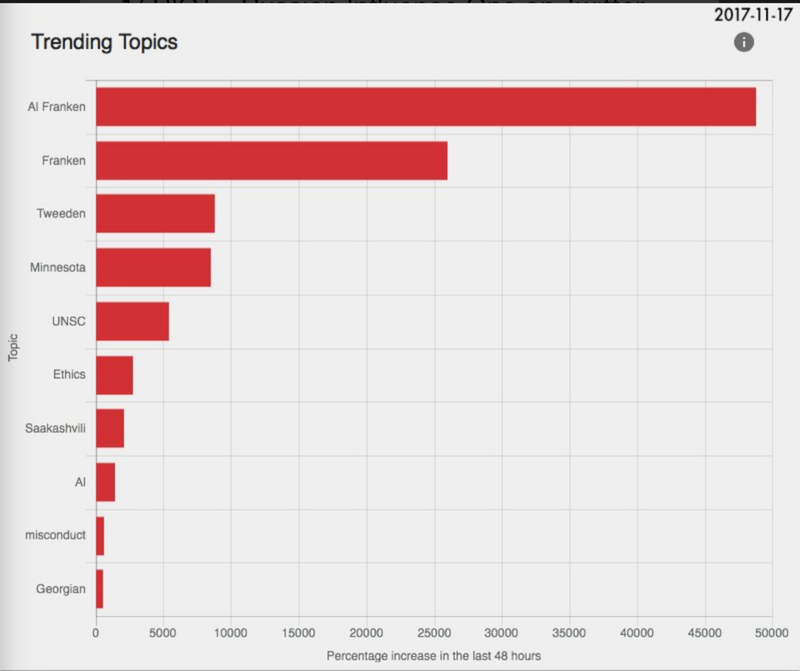 Now with all of this evidence mounted up to establish the clear orchestration among fringe alt-right media outlets and amplification from Russian bot and troll activities — that should have been enough for our mainstream media to take a step back and evaluate the situation. Yet by the afternoon of November 16th, just mere hours after Tweeden’s article was published, she’s already appearing on CNN. The following day she appears on The View. Roger Stone’s work here is done. 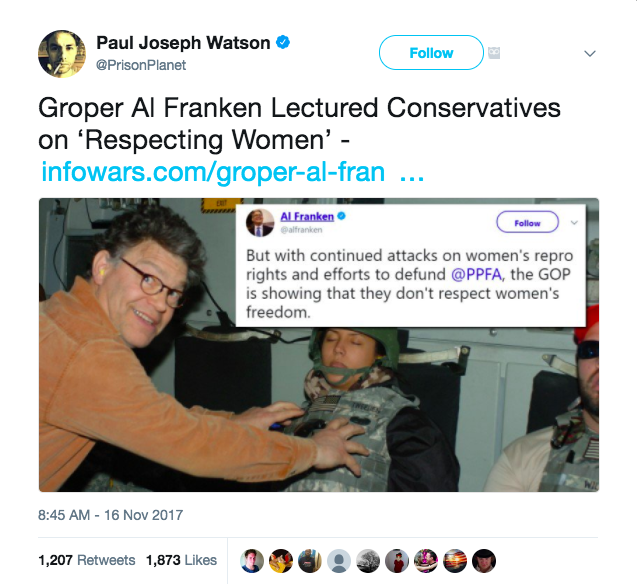 By the following day, November 17th, the story has already taken such hold of our national discourse — with Franken fans demanding his resignation and TV hosts all too eager to say “Roy Moore and Al Franken” in parity — the orchestrators feel confident enough to just come out and admit what they’ve done. They issue a statement saying they tipped off “other new partners”. Think about this — KABC-AM didn’t go to ABC News with their story. They went to “news partners” outside of their organization. Have you ever heard of CNN calling up MSNBC to coordinate coverage of a story? Does Washington Post have a conference call with New York Times and Wall Street Journal to fill them in on a scoop? Suddenly, coordinating a news story with outlets like InfoWars and Breitbart is an acceptable, not-at-all-strange thing for a media organization to do. This normalizes these propaganda activities, and sullies the ability to question an accuser — even when they aren’t credible. Strange how all this preparation went in to leaking the story, yet none whatsoever when it came to identifying corroborating sources. This incident follows the traditional line of amplification and coordination for manufactured news stories created by the Alt-Right Propaganda Machine. First, a fringe outlet publishes the“news” — in the election you’ll recall that this was often via Russia Today or Sputnik. But now that these “media outlets” have been forced to register as “agents of a foreign government”, American Alt-right media is all too happy to fill in the gap. After all, this is OUR AMERICAN PROPAGANDA MACHINE NOW! 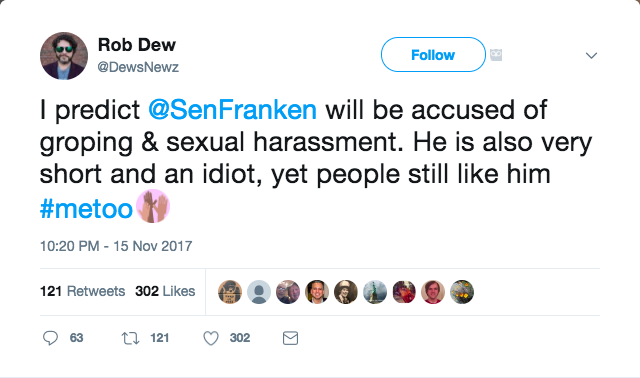 Several women who have worked closely with Senator Franken, both in his capacity as a senator and during his time at SNL, have come forward to defend him. Yet their words received barely a scintilla of the media exposure Leeann Tweeden and her uncorroborated claims did. Why? Because “the left” doesn’t have a rapid-response cyber army to help amplify their stories. 10. Always believe the women….? What if she conspired with the worst propagandists in America to disseminate this story? Can we ask if that makes her less credible? What if KABC is owned, in part, by the Mercers? Can we ask if that makes the lack of editorial oversight suspect? What if she’s appeared as a Hannity panelist arguing for Obama to release his birth certificate? Can we ask if she has political motives? What if taking a crass photo is now comparable to molesting 14-year-old girls? Can we argue that democrats are, once again, walking right into the trap?